Chris Rashley from Southampton, England celebrated his 27th birthday today [Dec 8] by winning Races 4 and 5 at the Amlin International Moth Regatta in Bermuda. 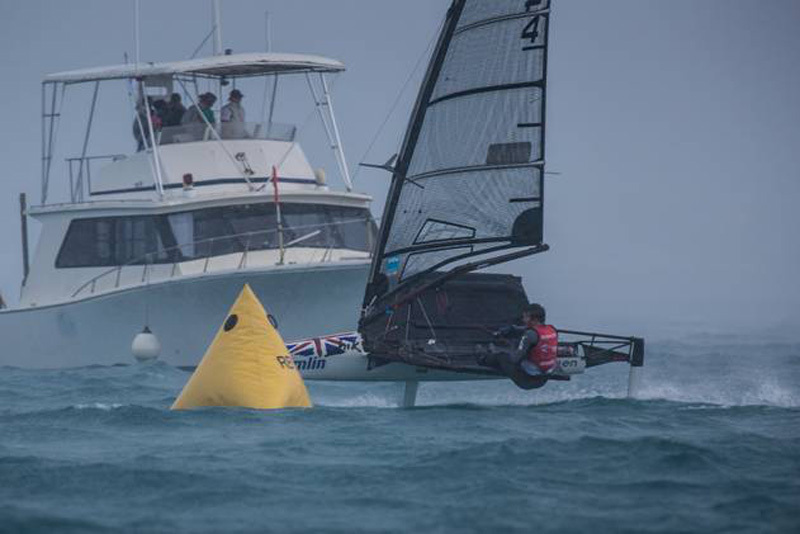 Rashley overcame strong winds and near-blinding conditions, punctuated by a squall with gusts topping 30 knots, to take over the lead of the $10,000 regatta. Tomorrow Rashley will wear the yellow bib recognizing the overall leader at the regatta. With the wind blowing 18 to 24 knots as the fleet sailed to the racecourse on Great Sound some never even made it to the first start. By the end of the day at least half a dozen boats were brought back to shore on RIBs after suffering broken masts. Others suffered breakdowns that included broken booms, tillers and tiller extensions and other controls such as boom vangs and cunninghams. The strong winds resulted in some blistering speeds for those who could handle the conditions. “I crossed the finish line doing 28.8 knots,” said Benoit Marie of France in his heavy accent. “I think I was doing over 30 knots at some points, but I wasn’t able to look at the speedo all day, you know? It was crazy. Rashley said he was doing 28 to 30 knots on the runs, but had to slow down to 22 to 25 knots approaching the leeward gate to keep in control. The runner-up at last summer’s European Championship and the 2014 Worlds, Rashley is one of the class’s all-time tinkerers, developing sails, masts and foils to near perfection over the past five years. Before coming to Bermuda last week for practice he fashioned a new paddle for the wand that controls the height of the Moth on its hydrofoils. Hoping to make a paddle that doesn’t bounce off the water too much, which would lessen the movement of the flap on the main foil and provide a steadier ride, he had a paddle fashioned from a 3D printer that was painted bright pink. During a windy practice day, it suddenly went missing. “I was sailing upwind and doing 16 to 20 knots last week when a fish bit the paddle right off the wand,” said Rashley. The Amlin International Moth Regatta is sponsored by Amlin plc, a FTSE 250-listed independent global insurer and reinsurer with operations in the Lloyd’s, UK, continental European and Bermudian markets. Additional sponsors include the Bermuda Tourism Authority, EFG International, Gosling’s, the Official Rum of the Regatta, and Kaenon Polarized.